We’re delighted to be welcoming drummer, percussionist and Director of Beat Goes On Ollie Tunmer for our upcoming Samba Drumming and Percussion workshop on Wednesday 24 May 2017. Ollie’s workshops include STOMP-style Body Percussion (he was a cast member of the hit show STOMP), and Brazilian Samba Drumming (Ollie performed in the 2002 Rio de Janeiro carnival). As a drummer and percussionist I get to play a huge range of styles and contexts. I love it when contrasting elements fuse, like when I play drum ‘n’ bass in a huge samba band – great fun and the audience loves it! I’m a former member of the London and European Tour casts of STOMP and their sister show ‘Lost & Found Orchestras’. I was a huge fan of STOMP when I went to see it as a teenager so it was dream come true when I got the job! I love percussion as a platform to connect with people from all over the world. Even if you don’t speak the same language you can share musical experiences, creating bonds as humans as well as musicians. What has been your most memorable workshop-leading experience? I recently delivered a keynote speech and workshops at the Latin American Heads Conference in São Paulo. This allowed me to demonstrate and discuss my approaches to teaching in a practical way, which, with a room full of Latin Americans, was great fun! 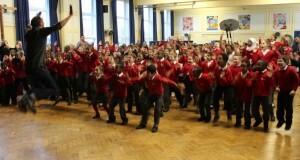 Beat Goes On deliver workshops all over the UK and abroad. I recently did some work on a BFI/Film4 feature film so as well as schools, CPD events and team-building events you can also find us on film locations! What can attendees expect to take away from ‘Samba Drumming and Body Percussion’? The course will be a fun, accessible, challenging and rewarding session. All participants, regardless of prior percussive experience, should be able to take away some of what they learn and use it in their own teaching contexts immediately. Of course, some things might take a little practice or require adaption, but that’s the same with anything new.